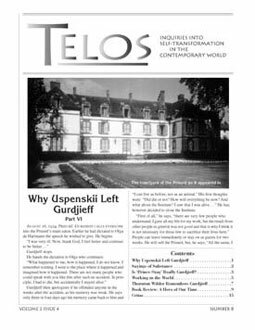 Gurdjieff closes the Institute and four months later begins to write All & Everything: Beelzebub's Tales to His Grandson, with Orage editing the English version. Orage's identification strengthens as he falls in love with Jessie Dwight and begins to assert his 'independence' from Gurdjieff. In his book The Unending Quest, the Englishman Paul Dukes relates his first encounter with 'Prince Ozay' in St. Petersburg. Ouspensky spoke to Gurdjieff of "the terrifying mechanization that was being developed in the big European cities...." As Ouspensky saw, and most likely also the Unabomber, "People are turning into machines." What will keep us from turning toward barbarism? Gurdjieff has a unique perspective on this question, "A man may be a man while working with machines. There is another kind of mechanization which is much more dangerous; being a machine oneself." The writer Thornton Wilder recounts his first impressions of Gurdjieff, from Thornton Wilder, Memoirs II.